Peni Loki, a male nurse of Labasa Hospital lives and shops alone at Shop N Save Supermarket fortnightly. He is married with a child but, his family lives in Suva. 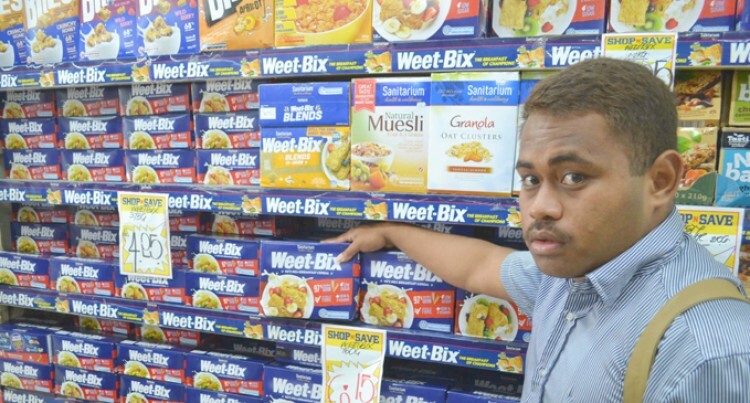 Peni Loki, a male nurse of Labasa Hospital lives and shops alone at Shop N Save Supermarket fortnightly. He is married with a child but, his family lives in Suva. “They did not come with me when I was transferred from Suva to Labasa,” he said. He said he was using his shopping experience when he shopped with his wife in Suva. According to Mr Loki he chooses to shop at Shop N Save, Labasa for the range of products they sell and the quality of products in their store always attract other shoppers. The staff at the shop he said were always ready to help and the display of their products were always attractive. For Mr Loki his shopping budget ranges from $80 to $100 a fortnight. He said when preparing his list he was always mindful to include healthy food. “Diets rich in foods containing fiber, such as some vegetables and fruits, may reduce the risk of heart disease, obesity etc,” he said. Mr Loki said he was guide by the advice whenever he went out shopping. His advice to the shoppers is that to not indulge a lot into buying unhealthy food because it health is wealth. He admitted that whenever he goes shopping he never misses his favourite tinned fish the “Skipper Tuna”. “That’s my favourite as the taste is very good,” he said. The Labasa Hospital male nurse favourite dish is dalo leaf with coconut cream(lolo rourou).